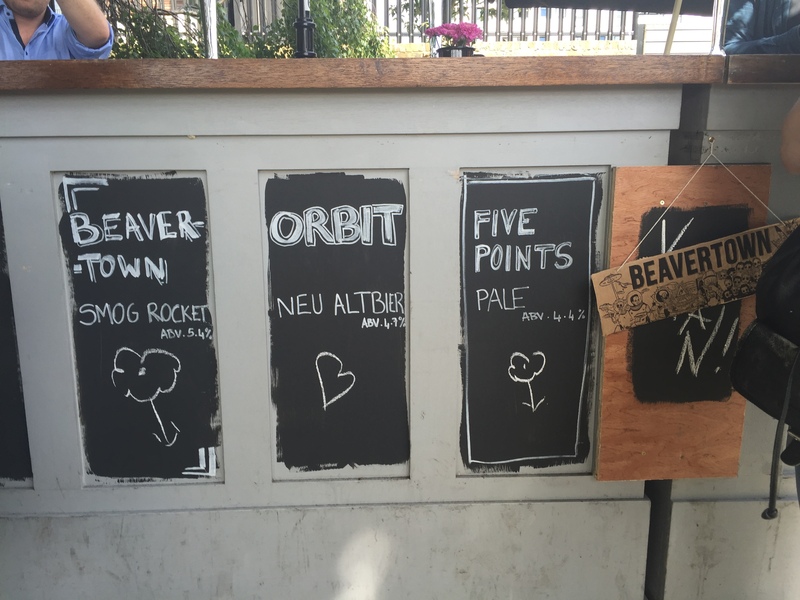 At the Vegan Beer Fest in the beer garden of the beautiful Old Ship pub in Hammersmith, overlooking the rowers and pleasure craft on the Thames, a rollcall of London breweries included Beavertown, Orbit and Fourpure on tap, and Brixton, Redchurch, The Kernel, Partizan and Howling Hops. A tick sheet of all available was provided on entry, along with a plastic branded pint mug. The sun was out, and kids and dogs were allowed – as I was accompanied by both it all seemed a case of ‘so far so good’. There was an £8 entry fee, £5 if booked beforehand, and a wristband was provided. Exactly why became less clear after some time there. An entry fee and proof of payment suggests that the delights past the rope are worth paying for. But when you’re paying £6 for a pint of Beavertown Neck Oil or £5.50 for a 330ml bottle of, say, Orbit Nico isn’t a state of affairs worth storming the barricades for. In fact, buying two bottles of lukewarm beer, hurriedly and ineffectively chilled in a bucket of ice, and getting mere shrapnel back from the £20 note you handed over, had me hurrying the other way. We were there at 11, the advertised opening time, but it was woefully clear that a cloud of disorganisation had settled on the event and was in no hurry to clear. Many beer tents were unmanned, boxes of bottled beer basked in the sun, staff rushed to provide ice that was clearly in short supply. A queue snaked back from the draught beer stand. When I eventually reached the front, watched my beers being ineptly poured, and paid, they had no change. I wasn’t owed much back at these prices, but I was obviously going to need it. I paid by card – there was one reader for the whole bar. I vowed to get bottles on the next round. At the Partizan stand, the woman in front of me, with typical English reserve, watched smiling as her bottle was dumped in one go into a glass, giving her a pint glass of 90 per cent froth. She was then asked to take a sip so the server could upend the dregs of the bottle into her glass. Seeing this, I asked if I could take the bottle. I was told that under no circumstances could I do that. I didn’t think that the vegan crowd looked like that vicious a bunch. I insisted on decanting the tepid beer myself. I noticed two German lads strolling around and felt bitter Brexit levels of shame at this mistreatment of beer. When I passed a couple of hours later, she was still pouring it in the same way. No prices are advertised, and you’ve paid an entry fee, so the shock is akin to a cigarette punch. And not twenty yards away was the bar of the Old Ship, where you could buy many (vegan-friendly) beers and ales at normal pub prices, without the queues – and cold. 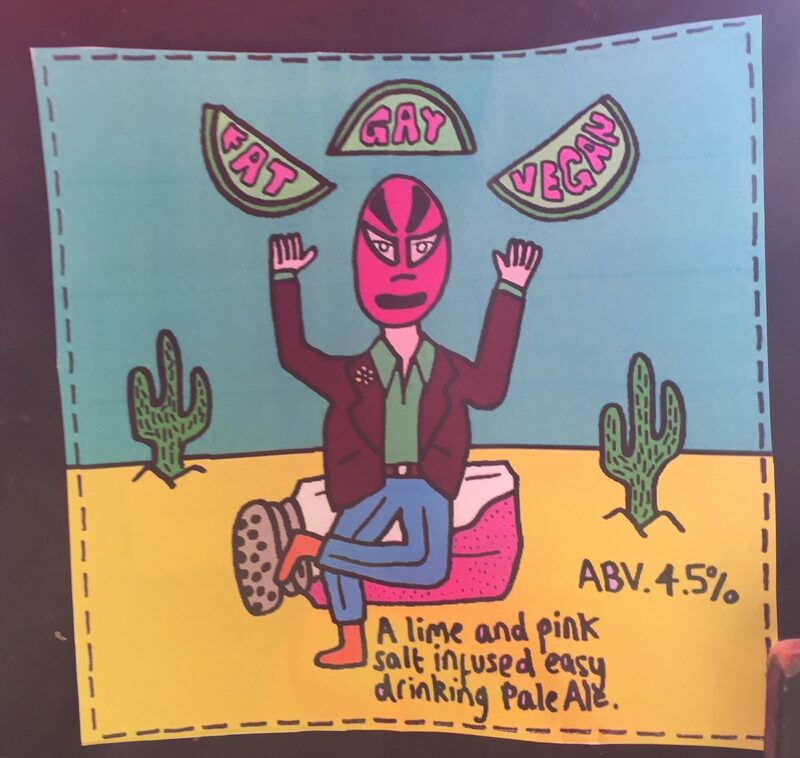 Most of the beers on offer in the garden were familiar to me, but I didn’t recognise Dominion Brewery Company’s Fat Gay Vegan Pale Ale. I can’t see myself asking for a pint of it at my local in Croydon. It was a Mexican-style salt and lime-flavoured beer, and I’m a big fan of goses like Salty Kiss from Magic Rock Brewing, the initial tartness and saltiness of which puckers lips and raises eyebrows but grows on you. This beer went down nicely – the side of a tree, after about half of it. Definitely an acquired taste, and not for me, I’m afraid! After a couple of hours in the sun and with hot beer swilling around your stomach, you’re going to want something to eat. Food was advertised, food was promised, and then promised again, as hungry drinkers started to complain about the lack of ballast available. Some chocolate brownies were promised “in ten minutes” – when we left three hours later, they still hadn’t materialised. In fact, I heard that they eventually arrived at 7pm. When some burgers eventually surfaced (tofu, mock duck, falafel) a queue formed rapidly. You got to the front, ordered, and your name was taken (“but we won’t call you”). You then queued again to pay (at £8 a pop) and re-queued at the burger stand where we watched in horror as dishes were prepared one at a time as the queue lengthened inexorably. It was a system phased out decades ago at Foyles bookshop and Soviet-era supermarkets but still good enough for vegans apparently. Vegans aren’t mugs and shouldn’t be treated as such. 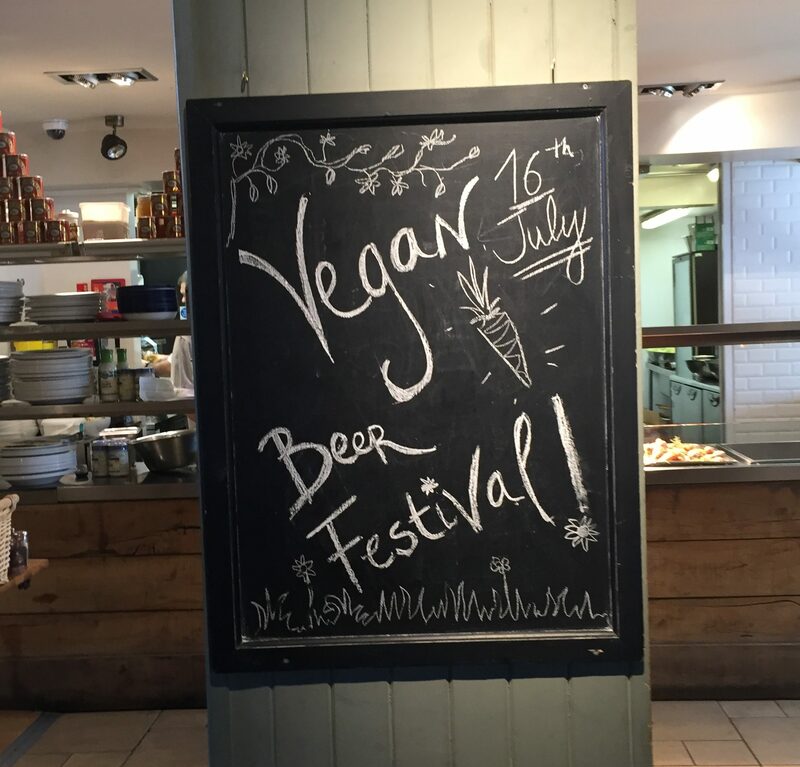 The good intentions of running a vegan beer fest are no excuse for poor preparation, sloppy organisation and lack of information (especially pricing). I got the impression that because vegan events such as these are (if you’ll forgive the appropriation of an animal metaphor) like hen’s teeth, and have worthy aspirations, punters were willing to give organisers a pass and pay the inflated prices. If this had happened at a regular beer fest, there would have been pint glasses sailing through the air. 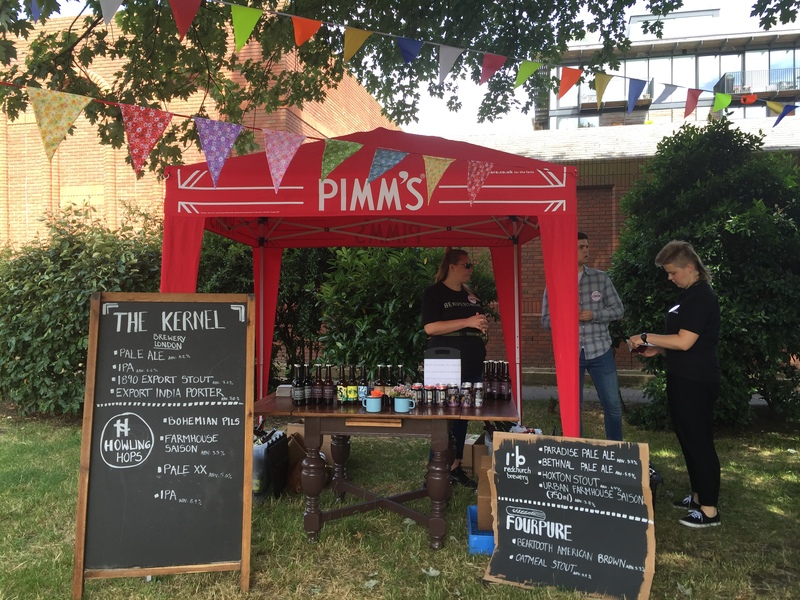 And maybe regular beer festivals are the place to head to for vegan drinkers. If anything, this beer festival shows that most modern beer is animal-free, so vegans might think themselves justified in going to a standard beer festival, and taking their pick of what is there. And certainly paying less than £6 a pint. There’s potential here – the venue was attractive, the food was good (when it turned up), the crowd was friendly. I hope that next year they can improve, have a rethink on pricing and make it a proper success. This entry was posted in Drinking and tagged in animal-free beer, craft beer london, hammersmith pubs, london beer, london vegan beer fest, old ship, old ship w6.